Lean Software specialise in building Data Processing Tasks for companies. Often we create a stored procedure for the upload operation as this offers the best range of Validation options. Just contact us now and get the perfect solution in record time ... you will be surprised what we we can do for you! In this tutorial we will help you complete the task of importing or processing data from a Microsoft Excel workbook file. We will demonstrate how to configure a task to complete this goal, and be able to quickly repeat the process time and time again. If you need help with this task, drop us an email to Support@LeanSoftware.net, with an example spreadsheet, and we may well be able to help you. In this first example we show you how to import to a table, and then also how to update a table from Excel. I another tutorial we will show you how to the data to a stored procedure. 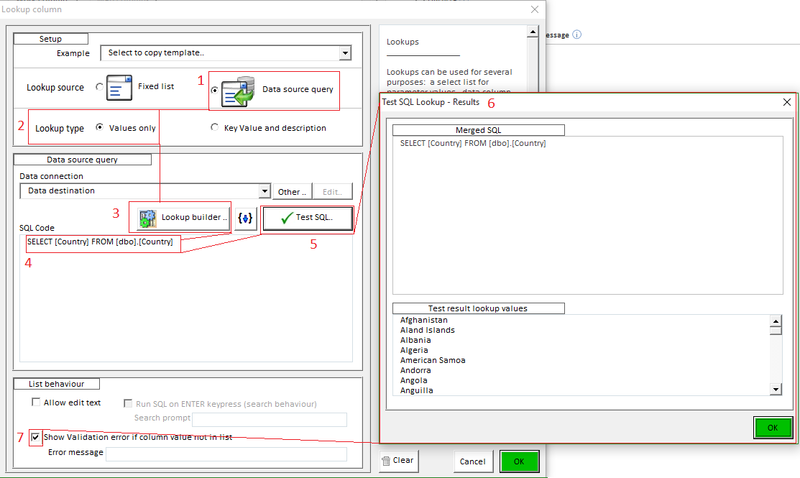 Setting up the task is a do it once process - EDT saves all your task settings into a task XML file. The next time you want to repeat the process you simply select the Task from the main EDT interface. You can later fully automate / schedule the task usingEDT exe command line options, and even launch the task from a task report email hyperlink. Be aware before we start - What are the pitfalls of importing Excel data into SQL Server? Often companies experience intermittent data import failures when trying to import Excel data. Your database administrator will be quick to tell you there are going to be problems if you plan to do this regulary. So how can we make this a secure and reliable process? How can the EDT software help you? Automatic validation highlighting any problems on a per-row basis. Validation is not just data type validation - but validation with the destination database itself - this being wrapped in a transaction that is always undone on any validation problem. Any number of validation rules can be added. Data can be sent to a stored procedure for more advanced validation, the procedure can return validation error messages. How does EDT compare to other import techniques? Compared to any other import method EDT gives a huge advantage, and provides a highly reliable import method. The reason companies have problems importing Excel data is the fact that users can modify data formats or make other changes that render the data or file invalid. EDT efficiently overcomes all these Excel import problems improving business efficiency and data accuracy. Here we assume you have already downloaded the EDT software (you can run this example even with the trial version, please see download page). Before creating a task we must first sign in to EDT to unlock its features. The default Password to log in is ''lean''. Once logged in select the ''New task'' option which has been made available. 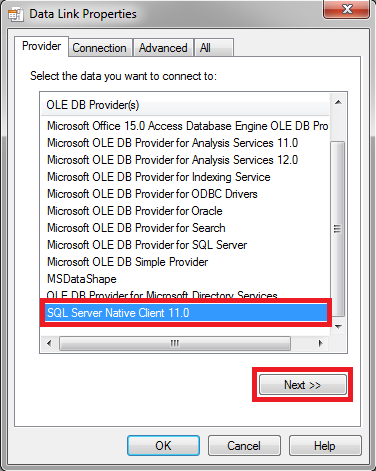 the data displayed (from the data source) is overlayed on top of the destination layout and is determined on the 'Data source / SQL' configuration tab. A task does not have to have data source, data can be pasted into a task from the clipboard if you wish, but generally it is much better to use the data source tab as data can be imported from any source. Insert what we call 'Work columns' - a user defined column that can be used for several purposes - a calculated value for example. We will stick to the basics for the purpose of this tutorial. 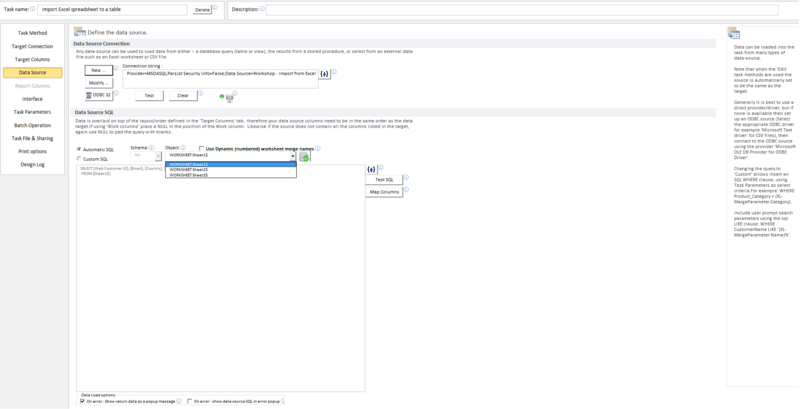 Click ODBC 32 to create a new ODBC connection to launch the windows ODBC administrator. Provide a Data source name and select the XLS workbook using the dialogue, select OK to close the ODBC administrator and return to EDT. 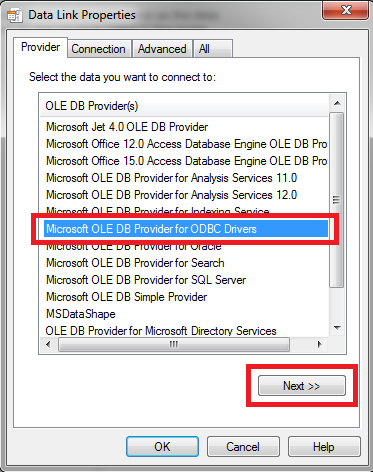 Select provider Microsoft OLE DB Provider for ODBC Drivers, click Next..
As shown in the above screenshot you will now see now how easy and brilliantly flexible it is to select data from the Spreadsheet Worksheets using EDT ! Add blank columns if you wish by using the NULL keyword eg SELECT [WebCustomerID], NULL, [Email].. In the example above shown above we have initially aligned the columns that match exactly, these being highlighted in green. You can drag and drop to alter the position/order of both the source and destination columns. We now need to exclude the unwanted columns, this will complete in step 8 and 9. Notice the source has a First name and Last name, but the destination only has a Name field, this we will deal with in Step 10. 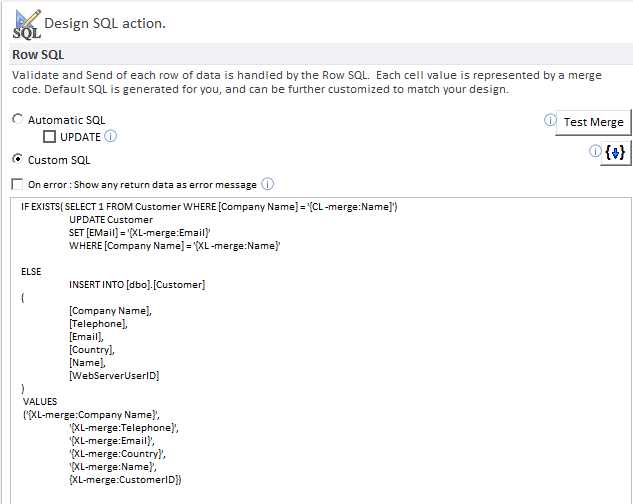 Notice that the SQL on the right hand panel is automatically updated to include only the columns required. Save the task and return to the main EDT interface, and we will see the data loaded and ready to be imported. Often a spreadsheet will contain unwanted rows, these might be blank rows or row that contain subtotals for example. As you can see in the above screenshot our data contains some blank rows at the end, these we will remove using the very useful SQL function ISNUMERIC() field to check for a value in column in the spreadsheet. There are several ways that EDT handles data validation within your task - ensuring the data is of good quality and good news for your business! When the data is loaded into the task, any missing mandatory data is highlighted. Notice that the Active Legend Red status shows a count of two rows . You can use the legend up/down arrows to very quickly locate the rows in each status band. Using the power of Excel Data Validation! In our example we are importing a Country value, but it must match with a valid country name in an existing Country table on SQL server. We can easily use EDT sql lookup column capability to validate these values. The option shown at the bottom of the dialogue Show validation error of column value not in list must be ticked for lookup validation to take place. 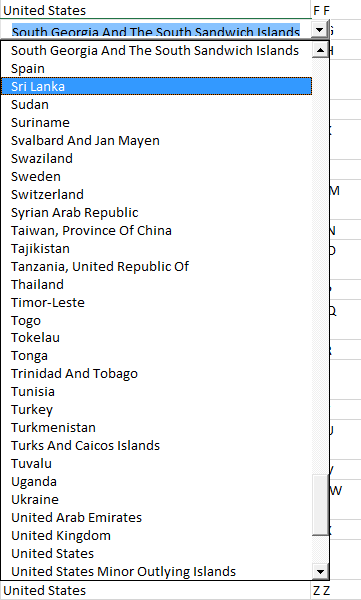 The user can simply click on the country cell and select the correct country name from the drop down list! Thats it! you have added the data to the database. It is quite possible you may wish to UPDATE data if a matching row already exists. In our example, if a company with a matching name exists, we will update the Email address only. We hope we have demonstrated that the EDT software provides a powerful and yet easy to use solution to importing Excel data - and we believe the most reliable import method in the World! Questions? - please comment or feedback below or contact us directly for more information. Thanks for this knowledge sharing. It encourage me to learn more about excel and database.